crispywaffle » Vanilla macarons: now with feet! Vanilla macarons: now with feet! I don’t really like macarons. Now I understand why every food blogger has a post on macarons. Why Laduree is a pilgrimage for any foodie visiting Paris. Why there are more than a dozen pages of macarons photos in TasteSpotting. They are nearly impossible to make right. Like, voodoo and magic impossible. And when you can’t make it right because some variable is off — the humidity in the room, your macaronnage technique, the aging of the eggs, the heat of the oven — you become obsessed. Really obsessed. Armed with what has to be the cutest macarons book ever, I love macarons by Hisaka Ogita, I made four batches of macarons over two weekends. And on that magical third batch: I got feet! I also added a bit of sugar to the meringue before pouring the sugar syrup to stabilize the meringue a little bit. I didn’t adjust the humidity at all; it was a ridiculously rainy day on Miracle Batch Day. 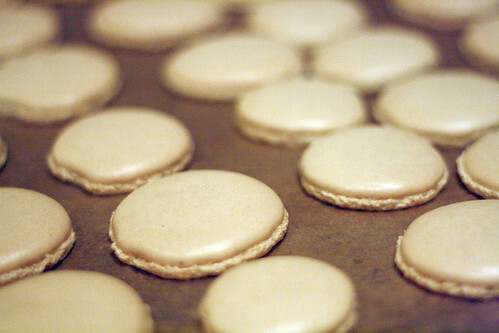 I did rap the baking sheet against the counter a few times once I piped the macarons. I stacked two baking sheets under one set of macarons to control the heat while baking. So that’s what worked for me. This time around, that is. I like the coconut filling because it uses up the egg yolks that you’ll have left over. I found it a bit too buttery, but I would probably just reduce the amount of butter a little bit, or just use the custard directly next time. Make sure to store the macarons in the fridge overnight before eating; the cookies need to ‘fuse’ with the filling to create that heavenly macaron texture. In a small heavy saucepan, bring the milk and coconut to a simmer. Remove from heat, cover and let steep for 10 minutes. In a large bowl, whisk together the egg yolks and sugar. Slowly pour the steeped milk mixture into the egg yolk mixture, whisking the whole time so the eggs don’t curdle. Pour the mixture through a strainer back into the saucepan. Stir constantly with a spatula over medium heat until the mixture starts bubbling. Cook for another 1 minute until thickened, stirring the whole time. Transfer the custard to the bowl of a standing mixer. Beat with a wire whisk until the mixture cools to room temperature. Add the butter one piece at a time. Once the butter is all added, whisk at a medium/high level until it’s creamy and light. Spoon a bit of the custard cream onto a macaron and sandwich with another. Store in an airtight container in the fridge overnight. Suunds really hard Sheryl. I think that I’ll wait till you come to visit and ask you to make them! oh, and bring some Almond flour too will ya? Actually, that’s admirable what you’ve done here. Love all the obsessive observation! I’d been thinking about learning to make ‘em really well just to say “I hate them, and they’re totally easy anyway,” but I figured I should be a more positive person. I agree with you about Laduree. I don’t know what the fuss is all about. That said, if you are going to mention “a tiny bakery” on my site, then you need to spill, no hoarding allowed. Out with the name please! Tholoniat – 47 rue Chateau d’Eau in the 10th arrondissement. A very understated storefront (in fact, all their stuff is understated – no garish colors!) amongst a bunch of African hair salons w/ barkers out front. I have yet to try them, but I am beyond intimidated to try making them myself – way to go! Thanks Omid – Next time I’m in Paris I’m heading straight over to the formerly secret bakery of yours! Let’s hope it changes my negative attitude about macarons. I too am a hater when it comes to the neon colors. Plus I gotta hand it to a place that hides itself amongst African hair salons. That’s like how some of the best food in Seattle is hidden amongst the Vietnamese nail places. Haha, I’m finding that everyone who’s made macarons has a ‘feet dance’. Sooo funny. Ok, now I’m going to make these just so I can do the feet dance. Your macaroons look absolutely gorgeous! I, too am guilty of feet dance, haha. These darn things are so finicky I’ve given up baking them for months. Though your post is now making me want to start again. your macs are perfect! 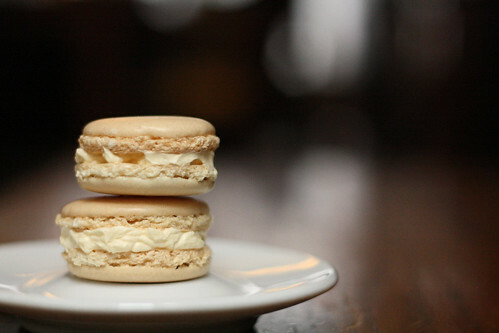 there is nothing better than a simple macaroon! I find that Ogita’s technique is the easiest to follow and I get excellent results each and every time I make them. You sold me with the coconut! Congratulations on being the blog of the day on Foodista today..that is how I found out about your blog! i have yet to try making macaroons… congratulations for the “feet”.. did you change your site? I know i’ve been here before but i like the refreshing look! Hello there ! thank you so much for the infos. I’ve tried in the last week or so 7 times and still cannot get the “feet” ~ I’ll try your suggestion but I have a question : when does the feet start to form ? at the beginning of the baking or toward the end….sometimes I think I l didn’t leave the macarons enough in the oven….I’ll try again with your suggestions !